Don't wait until your tyres are fully worn-off! Buy new tyres at discounted prices at www.giga-tyres.co.uk. All prices include VAT and transport costs. 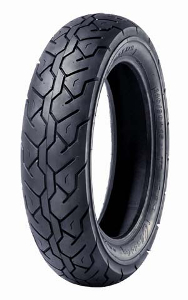 Giga-tyres.co.uk sells a large range of motorcycle tyres, which includes chopper tyres for your bike. We stock both rear and front tyres for those with a true need for speed. Select summer or winter motorcycle tyres and purchase a complete tyre set at a discount. The tyres that are on offer have been produced by many top brands from Adly to Hero and the like. Search our large assortment by motorbike type to find the right kinds of chopper wheels. We offer you some great discounts on many of these tyres and you might be able to benefit from free shipping. Since you might not just stay on regular roads or the highway with your chopper or motorbike, you should opt for the right kinds of tyres, which can handle even difficult road conditions, such as soft or sandy as well as mixed and even hard terrains. Optimal grip and even better driving comfort are just some of the features that these tyres offer. We bring you a large selection of touring tyres, which are optimal for long distances. If you are planning a cross-country tour, these are just the wheels for you. However, keep in mind that these kinds of motorcycle tyres are not usually in use for excessive cornering loads.